A salad made of fresh, tender greens is not only delicious and refreshing, but quite opulent because of the delicate leaves. If you have the opportunity to grow the greens yourself, even better! Fortunately it's easier than ever to find nice greens in many grocery stores these days. Be sure to wash your greens and remove any leaves with questionable spots. If the leaves are larger than you'd like, it's better to tear the leaves into smaller piece than to cut them. Cutting will bruise the leaves and cause them to wilt and discolor sooner. Also, it's best to dress the salad just before serving. 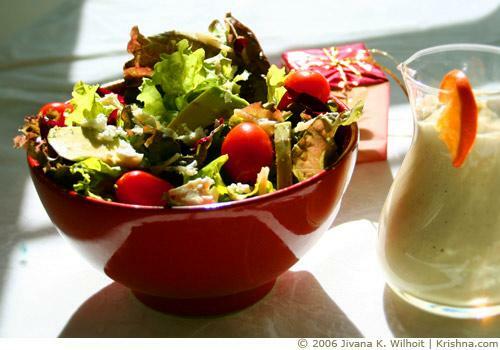 Some dressings tend to weight down the greens or make other ingredients soggy. I like to prepare all of the ingredients ahead of time, and store them in containers so they are easy to combine just before I offer them to Krishna, and then serve the salad to my family and friends. That way everything is fresh and delicious. Lowfat note: Avocados are a little fatty, but it's mostly good fat. And feta cheese is also a nice alternative to a high-fat cheese because it is made from sheep and goat milk. If you look for low-fat or higher quality feta, you're sure to find the healthiest variation. The unhealthiest part of this salad is the accompanying Cashew Date Dressing, but fortunately the salad is ideal for almost any light, oil-based dressing because it has so many flavors already. Combine all ingredients. Toss gently until well mixed. Serve with a nice dressing, such as the Cashew Date Dressing.